As I started planning my next projects using the Oak that I had slabbed, I knew I would want a bit of color. 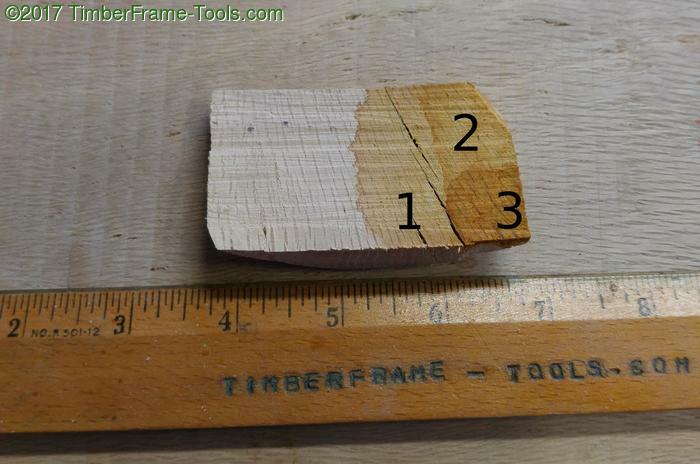 I wanted to accent the grain of the wood and not hide it, so I was leaning toward using a dye rather than a stain. My only problem was that I have never used a dye before, so I started devouring everything I could find on the internet. I decided to go with TransTint Dye as it has great ratings, can be added to just about anything, and should not raise grain since it is alcohol based. I went so far as to place the order for the color I wanted, ‘Honey Amber’… then within 5 hours I chickened out that I had ordered the wrong color and cancelled my order. A few days later I picked a different color, ‘Dark Vintage Maple’, and ordered it. It was backordered, so I cancelled my order and went with another option I had been looking at. I got the idea of using tea stain from some reading on the experiments from Dan’s Workshop and Woodworking for Mere Mortals. I was encouraged by the look. My only complaint was using the water-based tea. Having to apply several treatments, waiting for them to dry inbetween, then having to deal with all the raised grain was not that appealing. The assumption I was making was that a tea stain has to be water based. I challenged that assumption and won!!! Tea will give up its pigments in alcohol, just as well as it does in water. You don’t even have to heat it. 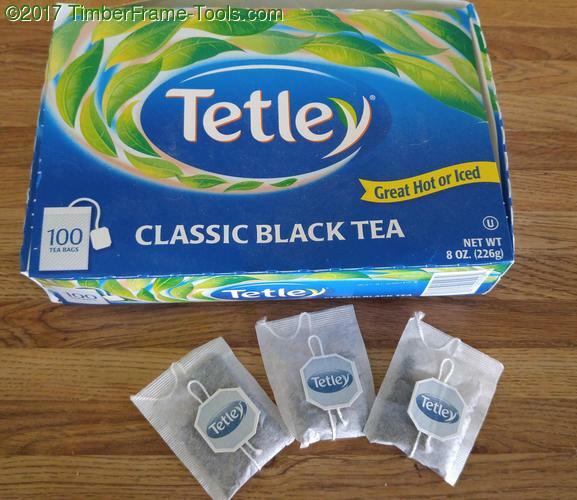 I started with Tetley Black Tea and placed three tea bags in a cup and poured in a cup of isopropyl alcohol. Then I let it sit for 3 hours. The color had come out of the bags and the alcohol was very dark. I put the same bags into a new cup of alcohol and let them sit for a few more hours. That mixture picked up minimal color, so there is nothing to be gained by letting the bags sit in alcohol for longer than 3 hours. I also tried putting another mug with tea bags and alcohol in the microwave for ~30 seconds. The alcohol got very hot and started to boil. The stain produced was no darker than when I just let the bags sit in room temperature alcohol. So there is no good reason to risk fire with heating the alcohol. I made up three batches of the tea (using a total of 9 bags) and added it to a spray bottle. I then topped off the bottle with alcohol, just so that I would have a known volume so I could repeat this recipe. I tried the tea stain out on a sample of the oak I was going to use. The numbers represent the number of coats I put on. I used 70% alcohol which has a fair amount of water in it (~30%) so when I applied it to my project, it did raise the grain a bit. I recommend using the 90% alcohol or better yet the 99% (anhydrous) alcohol as that should not raise the grain at all but is a bit more expensive. Spray it on. Let it dry. Sand off any bit of raised grain. Spray on more, letting it dry each time. The letting it dry each time is essential for reducing blotching by not letting extra thirsty areas absorb more than the other areas. Easy to make as much as you need. Does not obscure the wood. I did a fair amount of testing and experimentation on this. What remains untested, is the color fastness of this. I am not sure how it will hold up to sunlight. I was ready to make some more tea dye and started by putting the tea bags in 90% isopropyl alcohol instead of the 70%. Hardly any color came out of the tea bag. Apparently it needs the water that’s in the 70% variety for the color to come out. So my new method is to use a 1/4 cup of the 70% in a cup with the tea bags to extract the color, then when I put it in the spray container I dilute it a bit with the 90% just to keep the water content down. It still raises the grain a bit, but not as much as using straight 70%.